Pudding and frozen strawberries are blended with milk to create a smoothie that tastes just like a chocolate covered strawberry. 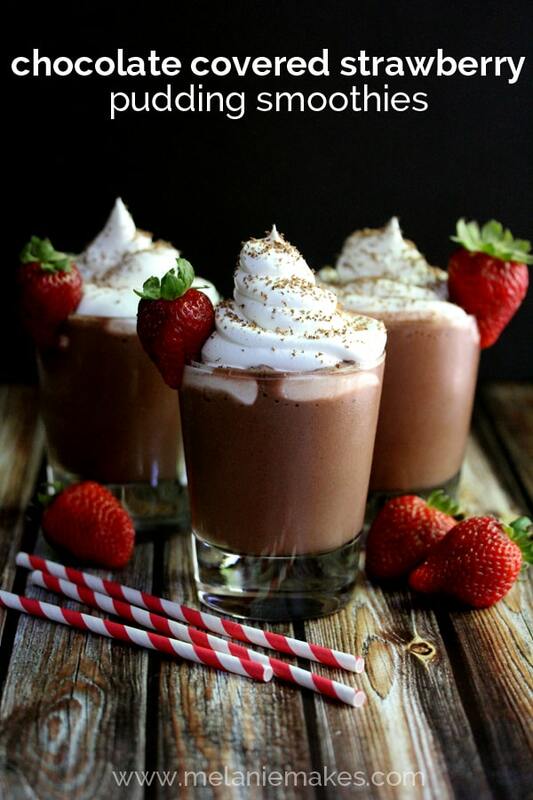 Garnishing each glass with whipped topping, chocolate shavings and a fresh strawberry makes these Chocolate Covered Strawberry Pudding Smoothies a special treat that will be requested again and again. Even though Summer is for the most part over having celebrated Labor Day, why is it that our warmest days have occurred within the last week? AFTER school is back in session. Coming up with refreshing after school snacks each afternoon has been a bit troublesome. But if the smiles and empty glasses after yesterday’s after school snack creation are any indication, I believe I’ve found the perfect snack which takes only minutes to create. 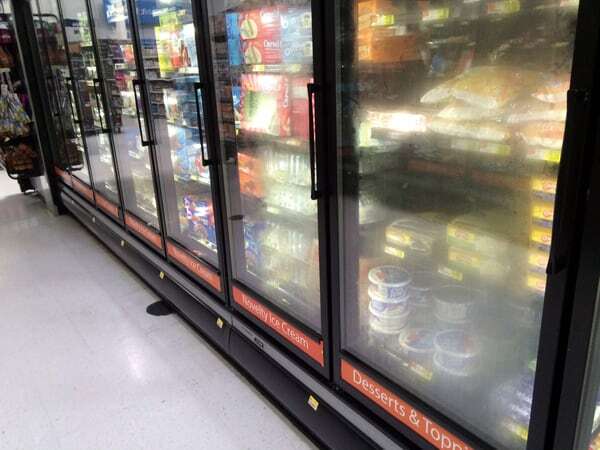 On a recent trip to Walmart, I stopped by the freezer section to snag some Cool Whip. (Please tell me I’m not the only one that hoards Cool Whip in their basement freezer to insure that I always have it on hand.) It was then that inspiration struck. With a name like Cool Whip, it was destined to create a cool treat perfect for after-school refreshment. And what pairs perfectly with Cool Whip? Jell-O pudding, of course! Another staple that I always have at the ready. With those two ingredients and some frozen strawberries, I was on my way to greatness. 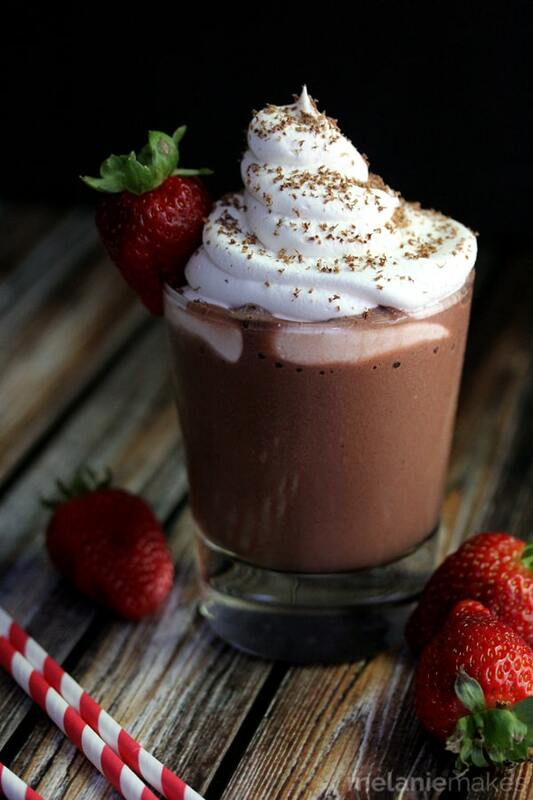 Pudding and frozen strawberries are blended with additional milk to create a smoothie with perfect consistency that tastes just like a chocolate covered strawberry. 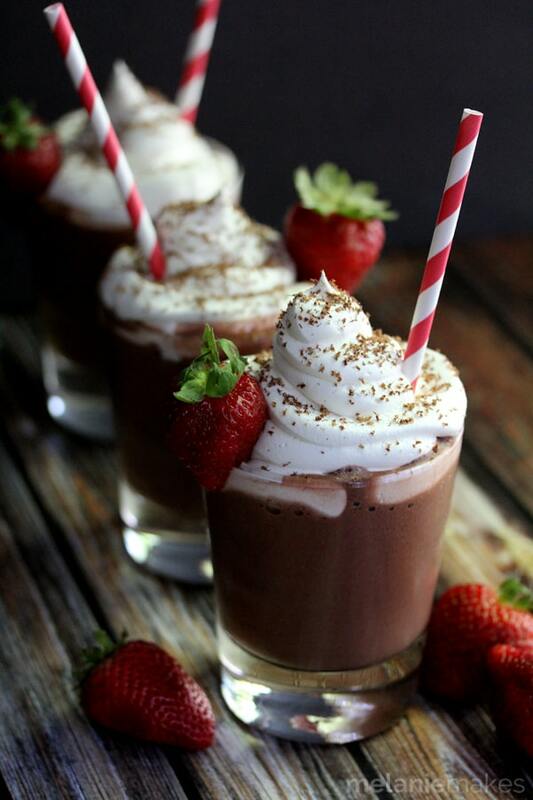 Garnishing each glass with Cool Whip, chocolate shavings and a fresh strawberry made it a special treat that’s already being requested to be made again. In a medium bowl, whisk together pudding mix and 2 cups milk until combined. In a blender, add pudding mixture, frozen strawberries and 1 cup milk. Blend until combined. 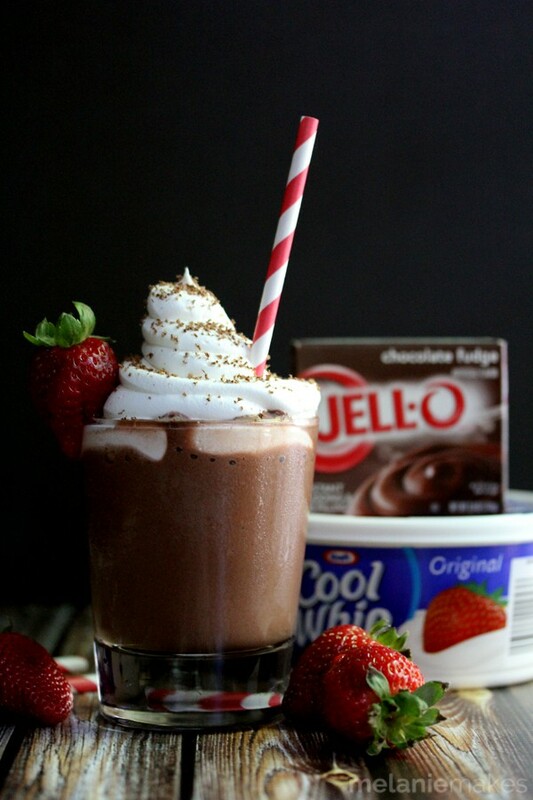 Pour into serving glass and top with Cool Whip. 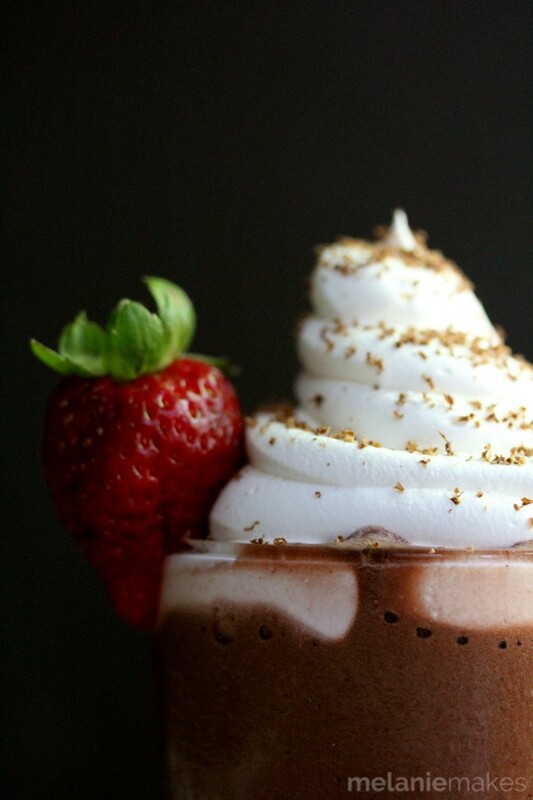 Garnish with chocolate shavings and fresh strawberries, if desired. So break out the blender. You’re about to become mother of the year with this amazing after-school – or anytime! – treat. It’ll be our little secret about how little effort and time they take to create. Melanie, these look so delicious! I could totally go for one of these right now. Definitely perfect for these insanely hot days we're having right now! I love cool whip and pudding so i am definitely loving this shake! Such a classic pairing, Kelley! These look so good! My kids would totally love them! I love how pudding makes smoothies so smooth and creamy! I definitely earned major mama gold star points with these, Jaren! This looks wonderful! I never thought to make a smoothie using pudding, but it sounds great. I will have to try it! I want to come over for 'after school snack'! How can you go wrong with chocolate, pudding and COOL WHIP?! Gosh, this looks so good. I'd inhale in one sec! I might've done just that, Shinee! This, my friend, is my kind of smoothie! It looks absolutely delicious! Thanks, Sara - I'm such a sucker for chocolate pudding! What a delicious looking smoothie!! I would love one of these right about now! Your kids don't know how good they've got it! This looks amazing Melanie! Wish I had one to sip on right now. I'm going to tell them that you said that! Frozen strawberries make everything taste better - these look amazing! And that's exactly why I buy them in bulk at Costco, Kelly! This really does look so simple but complex at the same time. Very clever! Such kind words, thank you Ginny! There's nothing quite like the combination of chocolate and strawberries! What a great idea for a smoothie! This is almost too pretty to eat, but eat it I would! Awesome! Wow these look beautiful!! I'd love to try these. Gosh this looks PERFECT Melanie! I wish I had one right now :) Pinned! Come over anytime, I'll share! One of life's perfect combos together in a smoothie! Fabulous! Thanks, Jaren - totally agree about the perfect combination! Can't go wrong with the chocolate strawberry combination! This looks great! You're so kind, thank you Janelle! Yes I admit, I almost always have cool whip in the freezer. I love what you have done with it. The combination of strawberry and chocolate is irresistible. We should start a club for those of us who hoard Cool Whip, Christie! Collective Bias must be ecstatic with this creation because it is FANTASTIC!! Not only does it sound amazing but your photos are stunningly gorgeous. You are one talented woman!! Can't even tell you how much your comment made my day, Kristy. Thank you so, so much! You had me at chocolate....and strawberries....and pudding. Just lovely! Pinned. Happy Friday!